I swear on my blogging bible that every word of the following story is true! This experience cemented my belief in the power of positive thinking. Eight years ago one of my best friends was in the hospital for two months. She was having serious pregnancy complications, and the only chance her twins had of surviving was complete bed rest under constant medical care. Needless to say, it was a long sixty days for her. One of the things that saved her sanity was watching The Ellen DeGeneres Show every day. She loved her positive attitude, and Ellen always made her laugh. When my friends' babies were born early but healthy, we all celebrated! I wanted to do something special to reward her for her hard work. I decided I would take her to L.A. to see the Ellen Show. Famous last words. I had no idea how hard it is to get tickets. I tried everything for over six months. I went online and filled out the ticket form - no go - every day the shows were already full. I tried emailing Ellen - yeah, me and thousands of other people. I was obsessed with getting Ellen tickets (just ask my husband - he was getting tired of my obsession) - but nothing was working out. After many months, I finally gave up on the idea of seeing the show. I was so disappointed - I could just picture us in the audience. C'est la vie - I decided to take my friend to L.A. anyway for a long girls weekend. And there was Ellen Degeneres. She was shopping for sweaters with her now wife, Portia De Rossi, and a sales clerk. I turned back to my friend, and we stared at each other with wide eyes, not knowing what to do next. We snuck back around the corner to regroup, and quickly decided that we would always regret it if we didn't say something. I was a little worried about this. I'm obviously not a celebrity, so I can only imagine how annoying it is to be bothered every time you go out in public. But the opportunity was too good to pass up, so common sense went out the window. I cautiously approached Ellen and Portia, all the while waiting for a bodyguard to step out and haul me away. When I caught Ellen's eye, I apologized for interrupting her, and asked if I could say hello. She immediately turned to me and said "of course"! Dear readers, she talked to us for 45 minutes. She was kind and gracious and truly engaged in our conversation. I can tell you that she is just as nice in person as she appears on television, and actually much more beautiful. Her eyes are a piercing shade of blue - I couldn't look away! She posed for a picture with us, taken by Portia. My husband was mad about that - he thought she should have been in the photo! Definitely true, but we were too overwhelmed to think clearly. Luckily the section of the store we were in was not crowded, so we had her to ourselves the entire time. Eventually I got around to telling her my story of trying to get tickets to her show. She immediately pulled out her phone, called her assistant, and had two tickets put on will call for us for the next day's taping. We were speechless. Meeting Ellen in person, and getting tickets for the show? We finally broke away and let her get on with her shopping. The next day we went to the taping and were given VIP treatment. No waiting in lines, the best seats in the house, and Ellen came over and talked to us again during a commercial break. It was a once in a lifetime experience. When I got home I sent her a copy of the picture with a thank you note. She returned it with her autograph and a nice handwritten letter about how much she enjoyed meeting us too. I mean, who does that? I will never again doubt the power of positive thinking. Even now, all these years later, I think about that day and the chances of our paths crossing. I think it was truly meant to be. Love ya, Ellen! It's always nice to hear a story like that! Very cool! What a truly brilliant story. Lucky lucky you! Of all the people I think I'd like to meet Ellen would be in the top 10. We definitely felt very lucky! A beautiful story and a testament to the power of positive thinking. Life brings these moments to us. We must always be open to wonderful possibilities. Thank you so much for sharing this with us. 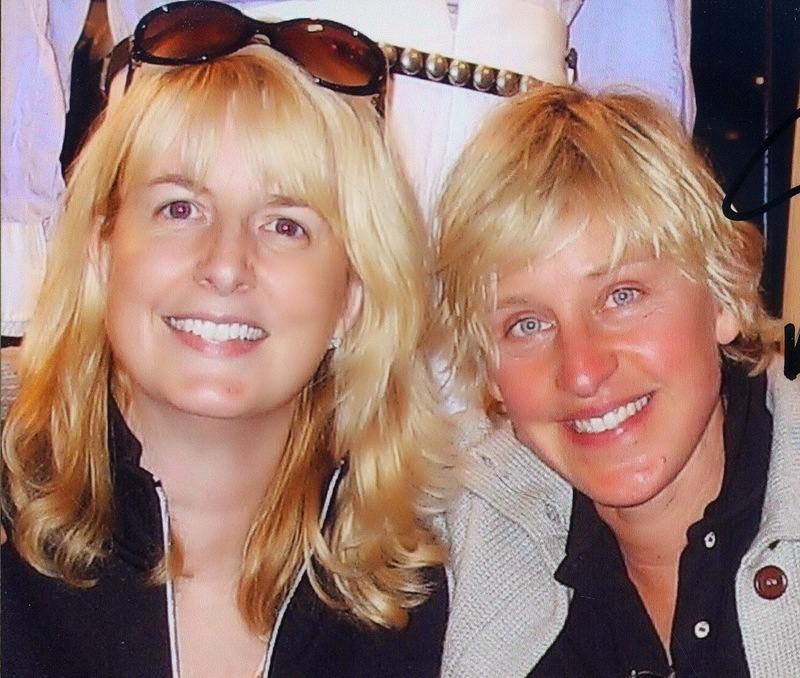 I am a huge Ellen fan and it really makes me smile knowing you and your friend were able to create such a lovely memory thanks to her kindness. Biggest hugs! I'm certainly a believer in the power of positive thinking after this experience! It's amazing how one story can give me a fresh perspective on a celebrity. I am so glad to hear that she is as kind and open in person as she seems on TV. That is a pretty amazing story. Your and your friend were MEANT to meet Ellen for sure. I do feel like we were meant to meet her that day. From what little I know about Ms. DeGeneres, it would be my guess that she would be friendly to anyone who approached her nicely. The fact that she talked to you for 45 minutes, and got you tickets to her show, AND spoke with you again tells me that she enjoyed your company as much as you did hers! She probably felt pretty lucky to have met you too! Your meeting with Ellen is an amazing example of the power of positive thinking, but the most special part of this whole story is the wonderful support you provided to your pregnant/postpartum friend! Thanks Susan. It was a pretty amazing day. It's wonderful when celebrities turn out to be just as nice in real life! What a sweet story! What an amazing story. So often we say things but don't mean it. I guess when she says "be kind to each other" she really means it! Yeah, I think about that every time I hear her say that at the end of her show. She truly is a kind person. Ellen certainly is! Thanks for stopping by Vanessa. The gossip rags all say she isn't very nice, and so having your story is really a good balance--since it's REAL LIFE EXPERIENCE and not gossip. Of course I can't speak for anyone else, but obviously she was VERY nice to us! I love this story, Lana! And yes it was so meant to be! I love Ellen! How can you not?! She is a pretty amazing person. Love this story and I love her! I had an encounter with her wayyyyyy back before she was on fire that always cracks people up. She really is awesome. Thanks Kristen! I'd love to hear your story sometime. That is such an awesome story! Ellen is so great - I have not been to her show but I would like to see it one day. I love how this great thing happened for you and your friend! Thank you. Her show was really fun - I'd love to go again someday. I've always loved Ellen and recently I was reading some negative press about her (via a gossip rag magazine) and I thought to myself that there was no way that could be true. Your blog post is now proof that Ellen is awesome and human and real! Such a great great story! I just don't see how anyone could write anything negative about her. She was pretty awesome to us! Thanks Ada. I couldn't believe she spent so much time with us! Thank you! I'll be sure to follow you back. Hi Lana, wow I can't believe that you mad your friend met Ellen and was on the show too! Wow there is power in positive thinking. That's a fabulous story! It was meant to be that you meet her and go to the show. So much more meaningful in the end, than just getting tickets the usual way. I'm glad to hear that she is a nice person - I just knew she would be! I definitely feel like it was meant to be! So cool! I love Ellen, she seems so real and down to Earth and SO MUCH FUN! Wow, that is a fantastic story! It is so nice to hear that a star like Ellen could be more than gracious to 2 fans! She certainly was gracious. Thanks! What an INCREDIBLE story!!! Lucky you! The Hubs and I LOVE Ellen and would give anything to meet her! We were definitely lucky! Even now I can't believe it really happened! this story is AMAZING!!!!!!!!!!!!!!! Makes me love Ellen even more!! The fates were smiling on your and your friend that day! Thank you! We definitely felt lucky! Thanks Alicia. Ellen does have a great spirit about her. That is an amazing, amazing story, and I agree; while I was reading it I thought it was meant to be too. It worked out the way it was supposed to. The Portia thing is still mentioned a lot in our house...oops. Oh my goodness! What a fabulous experience! I'm thrilled for you and for your friend! Have you seen the film with Portia and Wayne Dyer? Positive thinking!!! I haven't seen that film but I will look it up. Thank you Sue! I love your story! That's such a wonderful gift you gave your friend and I'm so glad it worked out better than you even expected. Ellen sounds like a caring person-what I fun job to be able to make people's day like that. She probably has the best job on tv! Thanks Holli! I love to hear stories about good celebrities (there seems to be so many stories about ones.) So glad everything worked out for you all! Thanks Deborah. It was a memorable day! Thank you Marie! I felt the same way - and I don't miss an episode of Ellen either! I have goosebumps!!!!!! WOW! So so so so so increduble! Thank you! Even now I can't believe it sometimes. OMG I love this story! I also adore Ellen and I do think she is regarded as one of the nicest celebrities around. Oh my goodness! How fun! I love Ellen. Thanks for sharing such a positive story. Happy SITS Day! This is SO AWESOME! How cool that Portia was gracious enough to let that go on too! Happy Sits Day! She was so patient and nice. Thanks for stopping by my blog! Oh wow! I am a huge Ellen fan so I just had to come check out the story! So nice to hear when one of your favorite people are nice in person! Congrats on your SITS day today! That's what I thought too! Thanks so much for stopping by! She really is! Thanks for stopping by today! So cool. She seems so real on tv that you hope it is not all an act. Thanks for sharing! She is definitely genuine! Thanks so much for stopping by! That's awesome! Happy SITS Day! Oh MY GOODNESS. I loved this story! I'm such a believer in the power of positive thinking, and today this was just the story I needed to hear. So lovely to have stumbled upon your corner via the SITS girls. Enjoy your week! I'm so glad you enjoyed the story - thank you for stopping by today! Happy SITS day! What a cool story. I love Ellen! I'm a fan for life! Thanks for stopping by! Now that's a great story. Thanks for sharing on your SITS day. Ellen is awesome! This just THE best story. Even on the second read!